Reem Island ... concept masterplan by Bunya. Despite the drop in oil prices, abu dhabi continues to focus on its infrastructure as it pushes ahead with its ambitions to boost the emirate’s tourism potential, says MRIDULA BHATTACHARYA. Mega investments in Abu Dhabi’s infrastructure and large developments at the emirate’s key islands are ensuring there is ample work for the construction sector, which can look forward to continued stability in the short term. Abu Dhabi’s ambition to propel its tourism sector and boost its transportation sector has spearheaded massive projects such as the $2.96-billion expansion of Abu Dhabi Airport, and the $11-billion Etihad Railway. Meanwhile, a major transformation is under way at Saadiyat, Reem and Yas islands. The Tourism Development & Investment Company (TDIC) as the master developer of major tourism cultural and residential destinations in Abu Dhabi, is pressing ahead with large-scale cultural, educational and retail projects including three world-class museums at Saadiyat, as well as iconic developments at Yas Island, which is poised to host a Warner Bros theme park. According to a report by Business Monitor International (BMI), lower oil prices pose little threat to the construction industry outlook. Abu Dhabi has the largest infrastructure investment programme in the UAE, with the water and power sectors securing Dh17.5 billion ($4.7 billion) in government financing over the next five years. Following this, the housing and social infrastructure sectors secured Dh12.7 billion ($3.4 billion), it said. In the infrastructure sector, BMI expects continued high levels of investment. Abu Dhabi’s fiscal position is extremely healthy. The emirate’s sovereign wealth funds (SWFs) are valued at about $627 billion or 250 per cent of the gross domestic product (GDP), and so spending will remain elevated, it said. “However, we do note the risk to private investment in Abu Dhabi in the face of lower oil prices. Abu Dhabi will see a modest slowdown in economic growth over the coming years as gains in the dominant oil sector become harder to maintain, especially in the context of lower global oil prices. While areas such as tourism and the government Abu Dhabi’s 2030 vision for economic diversification will continue to see a raft of new construction projects, we could see a paring back of investment. By no means do we expect a poor performance in the construction sector, but with the oil sector accounting for over half of the emirate’s GDP (gross domestic product), lower oil prices will certainly lead to a more cautious investment environment,” the BMI report said. Meanwhile, credit rating agency Standard and Poor’s (S&P) has reaffirmed that Abu Dhabi’s economy will remain resilient and its fiscal policy will be prudent despite the drop in oil prices. The real estate market also will continue to be stable, according to another report by JLL for the second quarter of 2015. “The general trend for Q2 and indeed the first half of 2015 has been stability, with performance of most sectors remaining flat, and a slight increase in hospitality performance,” said David Dudley, international director and head of Abu Dhabi office, JLL Mena. “Following a two year bull-run, we are currently going through a period of mid-cycle stabilisation. This is primarily driven by a slowdown in the pace of demand growth, but with short-term supply completions under control the market conditions are stable. The softening of demand principally stems from the decline in oil prices, which has directly affected Abu Dhabi’s dominant petrochemicals sector, leading to a reduction in domestic government spending as the government re-prioritises its projects, in addition to a decline in investor sentiment,” he added. JLL expects demand growth to continue, but at a slower pace. A number of launches took place this year, predominantly on Reem, Al Maryah, Yas and Saadiyat islands. These include Aldar’s West Yas and Mayan on Yas Island. Saadiyat Island also saw some new launches such as Bloom Properties’ Park Views which includes 234 residential units and a 188-key hotel apartment building. Work has also just started on Mamsha Al Saadiyat, the first residential development within the Saadiyat Cultural District. Al Maryah Island flagged off the first phase of the $1.5 billion Al Maryah Central, a mixed-use development. On Reem Island, Tamouh launched New Horizon, Aldar initiated work on Meera and Aabar announced The Kite. Earlier this year, Abu Dhabi Urban Planning Council (UPC) approved the Integrated Concept Master Plan (ICMP) for Al Reem Island. Among the major facilities detailed in the masterplan are 11 new private schools accommodating a minimum of 22,000 students, six dedicated nursery/kindergarten centres, a university (Paris Sorbonne), three new private hospitals and a number of clinics, nine mosques, civil defence and police facilities, a major transit hub, and 500,000 sq m of parks and open space, including pedestrian promenades for much of the Island’s coastline. The ICMP was submitted by Bunya in December 2014, after working closely with the UPC and Al Reem Island’s key developers – Tamouh, Aldar Properties and Reem Developers – over the past seven years to create a plan that incorporates the objectives of the developers with the requirements of the UPC. Meanwhile, according to the UPC’s figures released last month, the total floor area of developments given the green light has more than tripled in the second quarter of this year. The UPC announced that 26 development projects spanning a total gross floor area (GFA) of 2.3 million sq m were approved during Q2, compared with 708,999 sq m in the previous quarter. The number of projects given the go-ahead was up by just under 25 per cent from the 21 approved in Q1. 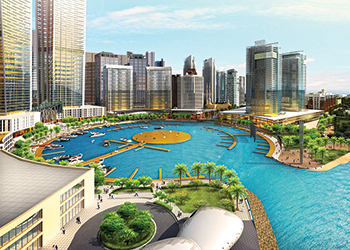 Among the projects that were given the go-ahead are a mixed-use tower development comprising a five-storey podium with three 24-storey towers, and two 24-storey residential towers on Abu Dhabi Island; the 49-storey Saraya residential tower on Abu Dhabi corniche; the 300-bed Burjeel Medical City project in Mohammed Bin Zayed City; the expansion of Abu Dhabi University’s female student accommodation building; the Remah Emirati Housing Stage Two residential project in Al Ain; and a mixed-use project in the Mirfa area of Al Gharbia. 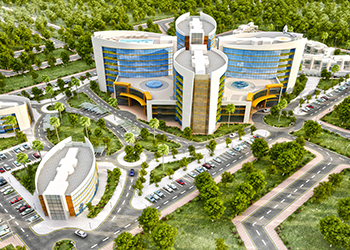 The 300-bed Burjeel Medical City ... set to rise in Mohammed Bin Zayed City. Abu Dhabi’s iconic Midfield Terminal Complex has made significant progress since the launch of work in 2013, with some 65 per cent of the work expected to be completed by the year-end. The massive terminal, spanning 700,000 sq m and with a capacity to handle 45 million passengers per year, is part of the $6.8-billion development plan for Abu Dhabi International Airport, which aims to be a world-class hub. Another ambitious project is the 1,200-km Etihad railway network, which is being built in three stages to link the principal centres of population and industry of the UAE, as well as to form a vital part of the wider GCC railway network. The first stage is the 264-km route for transporting sulphur from its sources at Shah and Habshan, which was completed in late 2014. The second 628-km stage will connect the railway to Mussafah, the Khalifa and Jebel Ali ports, and the Saudi and Omani borders. Preliminary engineering is complete and tendering is in progress for this phase, with contracts covering the final design and build to be awarded by the year-end. The final stage will add a further 279 km of rail, extending from Dubai to the northern regions of Fujairah, Ras Al Khaimah and Sharjah. Among the major road projects under way in Abu Dhabi are the overhaul on the Mafraq to Ghuweifat highway – the UAE-Saudi Arabia highway – which is due to be completed in early 2017, and the 62-km Abu Dhabi-Dubai road, which should be finished by August 2016. Abu Dhabi also plans to build a multi-billion-dollar metro as part of its Vision 2030, but the project has made slow progress since it was first revealed in 2009. Abu Dhabi has taken pioneering steps in adopt nuclear power for electricity generation, with the launch of construction of the Barakah Nuclear Power Plant, which is being developed by Emirates Nuclear Energy Corporation’s (Enec). More than 75 per cent of the work has been completed on the first 1,400-MW unit, is scheduled to be operational in 2017. The plant will eventually consist of four nuclear power generating units with a combined capacity of approximately 5,600 MW and their associated facilities. Unit Two is now 51 per cent complete, and construction of the overall programme is now more than 48 per cent complete, Enoc says. Additional units will follow at 12 monthly intervals, with the fourth unit set to commence commercial operations in 2020, pending regulatory reviews and licensing. Meanwhile, Abu Dhabi Water and Electricity Authority (Adwea) has about $1.3 billion invested in expanding five existing desalination plants. It has plans to build at least three new integrated water and power plants by 2016 to meet demand for water and power, according to BMI. According to Asteco, new launches on Yas, Saadiyat and Reem islands will add in excess of 3,600 new apartment units to the market from 2018, in addition to the 1,800 units announced during 2014, bringing much needed new supply to Abu Dhabi’s market. Demand for high-end villas has been positive in Q2, with Asteco highlighting the successful launch of TDIC’s Jawaher Al Saadiyat and Hidd Al Saadiyat developments. Meanwhile, a CBRE report tracking activity in the second quarter 2015 noted: “‘There appears to be a renewed focus on the development of high-end residences, particularly within the ‘investment zone’ areas, with less focus on much needed affordable homes. In the hospitality sector, about 5,300 rooms are likely to be added by 2017, pushing the emirate’s total room tally to 26,000 from 20,700, according to news reports. The second quarter of 2015 saw the soft opening of the 318-room Burj Al Sarab. Other major openings expected for the coming months are the Grand Millennium Bab Al Qasr (677 rooms), the Grand Hyatt with 368 rooms and the 315-room Marriott paired with a Marriott Executive Apartments. According to JLL, demand continues to grow, principally driven by wide-ranging government initiatives to increase tourism, including the expansion of the international airport and the national carrier Etihad Airways, improvement of Abu Dhabi’s leisure offering and hosting of world-class events and major campaigns by the Abu Dhabi Tourism and Culture Authority to promote Abu Dhabi.